I just love Retro Ads and recipes! So much fun. 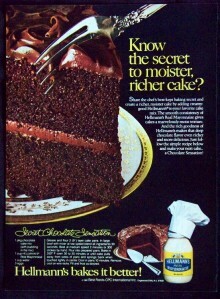 Here's an ad for Hellmann's Chocolate Mayonnaise Cake (and variations/scroll down). Beat cake mix, Hellmann's® or Best Foods® Real Mayonnaise, water, eggs and cinnamon 30 seconds in large bowl with electric mixer on low speed. Beat on medium speed, scraping sides occasionally, 2 minutes. Cool 10 minutes on wire rack; remove from pans and cool completely. Sprinkle with confectioners sugar or fill and frost. VARIATIONS: For A PECAN COCONUT TOPPED CAKE...combine 1 cup flaked coconut, 2/3 cup firmly packed brown sugar and 1/2 cup chopped pecans, then sprinkle over cake batter in 13 x 9-inch baking pan. Bake 1 hour or until toothpick inserted in center comes out clean. For A DECADENT CHOCOLATE LAVA CAKE...combine 2 packages (3.4 ounces each) instant pudding, 2 cups water, 2 cups milk and 1/3 cup sugar until blended, then pour over cake batter in 13 x 9-inch baking pan. Bake 1 hour or until toothpick inserted along edge comes out clean and serve warm.